Spaceship Eyes is a trance spacey, image inducing electronic project by Don Falcone (ex. Melting Euphoria and Thessalonians) on keyboards, electronic percussion, and sound manipulation. Don is also joined by Gary Parra (remember Cartoon?!!) on acoustic drums and Karen Anderson on percussion. A trademark part of the sound across these tracks is eerily laid back keyboard melodies accompanied by a banquet of sounds and effects that gurgle, pop, and burp enough to satisfy any space fan. The emphasis is on leading the listener through a journey making this very much a "mind music" recording. I do think it must be challenging to make a recording of electronic music. I know there's lots of stuff stuck in the New Age bins of any CD store that just miss the mark in terms of producing interesting music. But Falcone's focus on incorporating various sounds into the music to accompany the keyboard textures, along with some creative theme development make the music on Kamarupa relaxing, but also challenging and worth the listener's attention. Another plus is the addition of real drums and percussion on six of Kamarupa's twelve tracks. Parra's inventive drumming is in the background but complements the music nicely. The tracks with electronic percussion are no less enjoyable, but were certainly noticeable after getting accustomed to the real thing on the first several tracks. 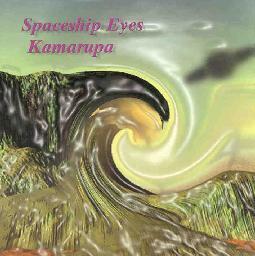 For more information you can visit the Spaceship Eyes web site.